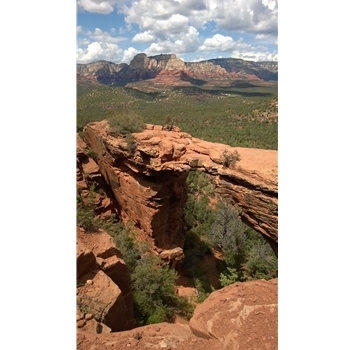 Located in West Sedona, this trail takes you to another wonderous Red Rock specimen in the beautiful back-country. Trail Description This relatively easy in and out trail guides you to a small canyon a few miles off Dry Creek Road. This popular destination provides easy access to Sedona's panoramic views. The hike begins from a small east side parking lot off of a popular Jeep tours road. If you have to walk the last 1.3 miles, you will have to burden this dusty traffic. Starting off on a wide and level trail, the hike meanders through a shrubby high desert forest of manzanita, pinon and juniper. After about 1/2 mile the trail starts working its way uphill exposing panoramic views. There is a fantastic lookout hidden off a Y about 3/4 miles in on the left, which happens to be under the bridge tucked away on the right about 75 fee above, providing 180 degree views. Returning back to the trail, follow the steep, natural, semi-man-made staircase up the rock cliff, which leads and opens you up to yet another spectacular vista. From this point, the bridge is just a short walk to the left...be sure to get in line for photos of this majestic sight! Accomodations: (on site) Toilets Directions: Take the AZ 179 to downtown Sedona to the Y with AZ 89A. Take a left at the roundabout and head West for 3 miles to Dry Creek Road. Turn right and head north 2 miles to Vultee Arch Road FR 152. We recommend parking here, as the last 1.3 miles on FR152 to the actual Trailhead requires an off-road vehicle with good groud clearance. NOTE: Red Rock Pass is required which you can get at most gas stations and Ranger Stations Accessibility: Rough dirt road or trail, off-road vehicle required.